Post-shower organic body oil rituals starting now; beach body happening hopefully in the nearish future. This story from RAAW in a jar founder Trice Christiansen is only slightly more scary than the state of my body skin: she woke up one morning to a terrible rash all over her face, which was a result of an expensive high-end brand she has totally trusted. Her confusion led her to a simple premise and the creation of her own line of natural, organic and holistic products made up only of ingredients she (and you) could easily understand. 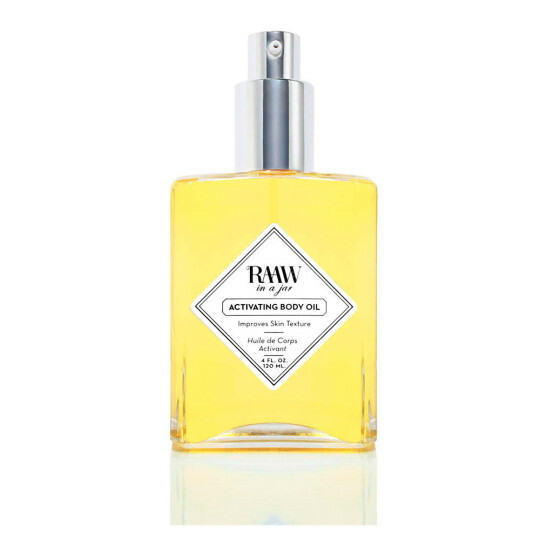 The Activating Body Oil comes in a humongous 4 oz bottle, with subtle lemon scent and a zillion powerful ingredients like lemongrass, grapefruit, kukui nut oil and more. It helps protect skin against environmental damage, soothes and softens, creates elasticity, deeply hydrates, increases blood flow (aka micro-circulation), helps diminish the look of cellulite and wrinkles … and it makes your skin look good. P.S. Of course skin sensitivities can happen with ANY product, but it helps to strip it down to basics that you can understand and keep track of if you do have sensitive skin.